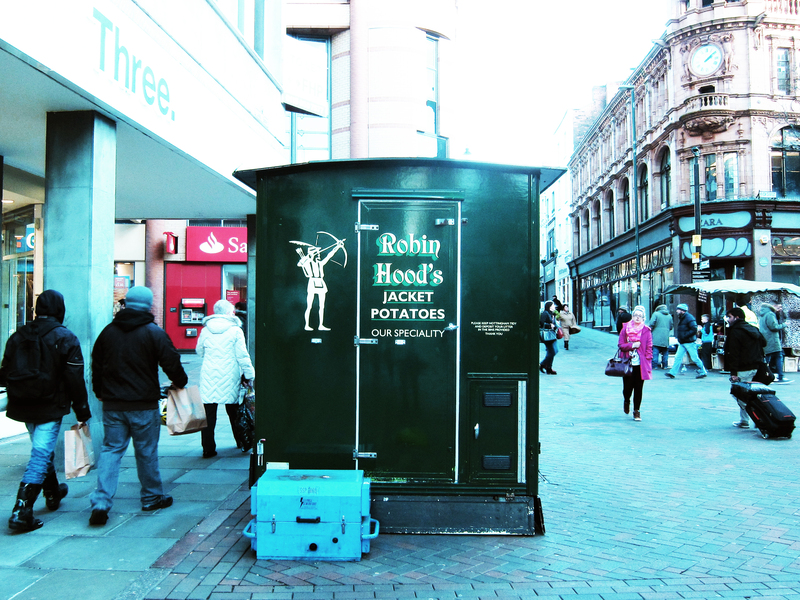 I’ve been excited to find myself in Nottingham, surrounded by what could be considered to be the earlier starters of activism, the Luddites. Luddites are seen as people who protested against the industrial revolution, by famously throwing shoes into looms. According to my initial research with local historians, Luddites were in fact lace-makers that wanted a change in the use of technology by a crippling system of middlemen that extorted huge prices from loaning the lace frames. The Luddites largely broke lace frames that they rented themselves, not looms. However, the story of their protest would be remembered as violent protesters that destroy and hinder progress. Activism, like technology, can be a vehicle of behavior change in society. An archeologist looks at the technological context and the social changes to explain a narrative of change. The social acceptance of both activism and technology is when they become designed into everyday behaviours -“socialised’ to become a part of the cultural fabric. Nowadays, when we focus mainly technology as digital technology, the battle of activism is in danger of replacing social movements with ‘clicktivism’. There’s a more descriptive term for the eye roll that’s associated with this – ‘slacktivism”. Perhaps there could be a more progressive crossover between social biotechnology (no, not just about people in lab coats holding glass tubes) and activism can create more critical, even productive voices? Biology, ecology, nature, food and animals hold a thick web of complexities that are waiting for a socialized voiced that can actually carry criticism and allow platform for exchange rather than the current neanderthalic alternative in the form of, er, death threats…? At start of this month, the mayor of the Vegetarian Capital – Daniël Termont, was holding a drippy joint of stiff Canadian goose leg, that would normally be poisoned and incinerated, and gnaws it off of the bone in front of a bunch of hungry squad of shiny black cameras and hairy boom mics. In exchange for a piece of my goose action I asked him about the future of activism for this ‘social’ city and quizzed if he was hoping that ‘brainstorming’ would eventually replace traditional demonstration. The mayor was surprisingly open to the conversations and seemed to be quite adventurous with my suggestions for his “smart citizens” and the future of activism. Interested in seeing Ghent as a model of a modern social movement, the crowd of locals took bites to finish off the leg. I was touched to have such a crowd of support at seeing people biting into my hard, not-so-slow-cooked and now cold goose leg and members of political vegetarians proposing with the Mayor that their monthly cabinet dinner to include the Canadian goose. Naturtarianism was much more than killing goose for ‘nature’ or wasting meat for identity. Naturtarianism was a prototype for how critical voices and proposals can create change despite reactionary impulses and behaviours. A fortnight after the event, a restaurant just outside the city started to advertise their new meat adventure with invasive grey squirrel meat, imported from the United Kingdom. In the UK grey squirrels are culled systematically for displacing the native red squirrels and there was a gap in the market to consume the ‘wasted meat’. Within a week of the news headline, the meal was taken off of the menu. It turns out that the restaurateur and his family started receiving death threats. Many of the experts that involved in Naturtarianism voiced their research, worries and hopes for a future with animals and the ecology. In Copenhagen last week, when a genetically ‘surplus’ giraffe was killed and fed to lions as apart of the breeding program, many of the zoo staff also received death threats after the 27,000 online petitions failed to save the animal. Sensationalist portraits of long-lashed giraffes drowned out the more interesting debates of controlling the genetic diversity of endangered animals bred in captivity. 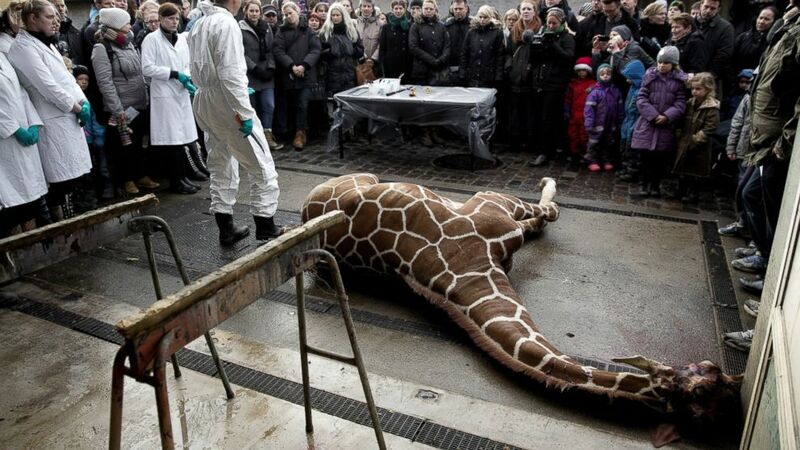 Giraffe killed to be dissected. Death threats don’t debate about what happens when human rearing causes ‘surplus animals” in breeding programs. Death threats doesn’t give room to reflect on the role of zoos from entertainment parks or farms to being the ‘curators’ of nature. In an age when “curation” has sprouted from obscurity into a field where people even “curate Facebook pages”, “curate their kid’s birthday parties”, “curate shopping carts” we feel that parts of ecology has also bloomed with our abundance of artifacts and data that there’s a need to select, curate, cull. There is a huge gap to be filled between our outdated polemic approaches with nature and ecology and our voicing of activism. We are in a world where foods and animals are woven in such complex systems that no individual can be ‘threatened’ into fillering the crack. However there is a huge potential to creating services and products that open up the debate and invite proposals. The ‘invasive’ goose, the pesty squirrel and even the ‘endangered’ giraffe can all at any time become surplus (bi-) produces. To be constructive we need to be thoughtful in future interaction.